We'd wager there have been plenty of times you tried to maneuver a drill/driver into a spot that just wouldn't allow it and wished you had a small, powerful tool that would drive a screw where others just can't go. Here it is. The PS10 is one of the handiest, most powerful little drivers we've laid hands on. It's impressively powered by "litheon," which Bosch calls "the industry's most advanced lithium-ion battery technology." We can attest that there's absolutely no lag in power, and the run time is great - more than 100 drives per charge. Recharge time is just 30 minutes, so you should never have to wait for a battery. The best feature, of course, is the clever design. Instead of a pistol grip like most drivers, this one has a sturdy tool body and an articulating head that has five detents, letting you set it however you need it. The head itself is just 3-1/2 inches long, so it's no struggle at all to slip it into tight spaces such as in between studs, under-sink cabinets, between joists and other tricky situations. If it's length you need, just flip the head to the vertical position and it's literally like having a screwdriver at your fingertips; it's not quite a foot long at its full length. It uses ¼-inch hex bits, and they're easy to change. We would have liked to see some on-board bit storage, but that's a small point. The two-finger trigger is comfortable, and it's quite sensitive, so take care not to strip your fasteners while you're on the learning curve. I never trust this driver when I use it. Unlike the PS20, which has good power, I am never sure if this PS10 is going to have enough torque & it usually kind of doesn't. It's awkward & clunky. The electronic clutch is kind of cheesy. It doesn't have the typical clicking of a normal clutch, it just makes a "squealing" sound when it's reached the clutch level, which always makes me feel like the tool is under a lot of stress. The driver is so wide that I can't meet my thumb with any of my fingers while holding it, which means that in order to put it in reverse I usually have to readjust the driver with one hand and push the button in with my other hand. I have done it with one hand, but the balancing act was so ridiculous that I stopped this practice since I could feel I was going to drop it very soon. This is frustrating because I have average sized hands so I feel it should be made for people like us. I am a lefty & have accepted that it's a right handed world, but now I'm expected to have novelty sized hands too? I use the PS20 90% of the time & this driver gets the left overs, thus if I had to pick one, my choice is obvious. But like many have said before, this tool has it's place & I would consider it a secondary must, restricting usage only for tight spaces. I'm glad I have it when I come across these situations. I would also suggest you set aside some 1/4 driver drill bits to go with it. They may cost a little more but like this tool, you'll rarely use them so why not? People, the free Bosch holster that comes with some of these is a must! Don't get these drivers without it! For it's intended purpose it's a nice tool but like others have said, it has some odd features that hurts instead of helps. I scratch my head everytime I press the trigger and have to wait for it to rev up to speed. I guess if you used it a lot you'd get used to it but I have no idea what the point of it is. I also have no idea why they even bothered putting a clutch on it. Why use an 8 position switch for 2 different settings? Last thing is the case. I guess it's better than a bag but a real case would be nice. I bought this to replace an old B&D that went through too many batteries. The Bosch LI-ion batteries are great for holding a charge. The tool is big to hold, but MUCH lighter than dealing with a cordless drill. The pivoting head is very handy. I use it mostly as a right angle screwdriver though. My electronic clutch is amazing, with great control, and the soft start trigger works excellent. My only gripe is the physical size (although I have big hands so it's not bad for me) and the lack of place to hold a spare bit. The bit release is great...simple to use and a sure thing with the proper bits. Power is good for driving screws through about #12, but don't try 1/4" lag screws. I bought this at the big orange home improvement store and really wanted to like it. The tool felt very heavy-duty, and the power seemed to be more than adequate for my purpose of installing cabinet hardware in tight places. The batteries charged very quickly. However, I noticed when I released the trigger, I could see a flash of light in the motor through the heat vents by the handle. I don't know if they all work this way, and assumed that they did, so I proceeded to use the tool. However, after I completed the work (I was driving the last screw), the driver stopped working in the forward-drive mode. It reversed just fine. I don't know if this had anything to do with the flash - maybe something burned out - but I had to take it back for a refund. I chose not to get a second one. I saw the ps10 reviewed in a magazine and was very interested. After purchasing and using now for over 18 months I am extremely happy with this driver. I am an electrician and use it daily on anything from trimming receptacles to hanging pipe/anchors. I have driven screws into lead anchors all day long on a single battery. The clutch takes some getting used to but once accustomed to it it works very well. I find myself going to the 18v DeWalt less and less as i find new ways to use the ps10. The only negative is Bosch needs to design a better way to carry the driver. While the clip is handy it tends to be awkward. Highly recommend this driver. A right-angle drill/driver is hard to do without. Goodness knows how many times we all have reached into tight places to drive screws manually with ratchets or short screwdrivers. Not fun, is it? 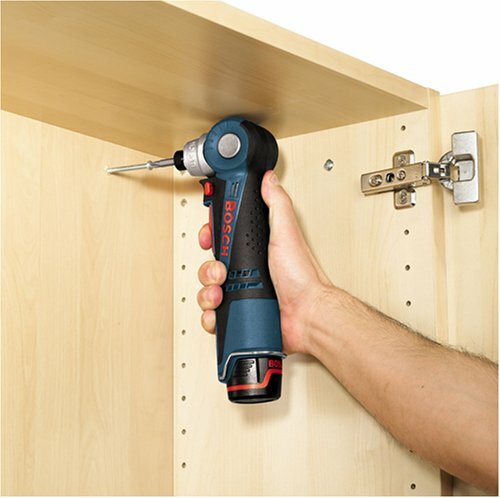 The Bosch PS10-2 gets into those tight areas for tasks like attaching drawer slides. Plus, it is reasonably small and light, so you will grab it for a lot of normal drilling and screw-driving tasks. The angle-head feature works perfectly and while 0 and 90 degree angles are the most used, once in a while another angle is useful. This Bosch uses what they call Clic-Change bits. These are 1/4 inch hex shanks with indentations on them (note that some bits have very small indentations for use in other devices. The ones for use in the Bosch are the bigger ones). They are available in every brand and every manufacturer makes drill/drivers that use these bits. This is not a Bosch exclusive. You pull the collar out, drop the bit in, and it is a quick and secure connection. Much nicer than wrestling with chucks. This is why they call these devices "drivers" instead of "drills". Twist drill bits can't be bigger than the hex shank, so they are limited in size and that makes it less flexible than a dedicated drill. Also, drills spin at high speed, while drivers are designed to operate at lower rpms. 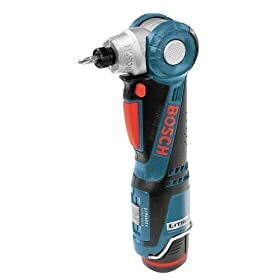 Bosch feels the primary use will therefore be to drive screws, and as a nut-driver. You can get spade bits because they have build-in hex shanks. Of course, a 10.8-Volt driver isn't meant to drill huge holes through studs all day, but it does have enough power to actually do that. You will still need to have a conventional drill with a twist chuck to use all the bits you have now and will need for many tasks. The slow-start feature would seem to be more useful on big powerful tools like routers, but you get used to it and can use a light touch when needed. The "clutch" isn't a conventional mechanical one and it takes a little getting used to, but it works. The angle feature is secure, the motor is smooth and powerful and everything seems well built. It is far from tiny, though, surprisingly big. It is not at all like those little electric screwdrivers. This is a full-sized, powerful drill/driver. What would make it better? It would be perfect if it had a a selectable impacting action. I'm in the middle of a move and I am pleased with this tool! I'm using it to take down all those things you put up during an extended stay and it's performed flawlessly. I wanted something powerful, reliable, and portable. It comes with two batteries, which charge very quickly, and a convenient soft carrying case/bag. It has all the power I need as a homeowner, and I feel it's fairly priced. Finally, it has a great warranty, but given Bosch's reputation, it probably will never be used. My only criticism is that it only comes with one flat and phillips driver bit. But, overall, I feel this tool is a great fit for most homeowners. The most borrowed tool I own. This is the tool that everyone at work seems to want to borrow. After the first guy brought one into work, three more people bought them right away. This tool is slightly larger than the pictures would make it seem but it is still very compact. I use the PS10-2 on a daily basis working on boats and it has made getting into tight places a lot easier. I service fitness equipment and this tool has paid for itself. Its the only tool of its type that Ive owned so I dont know how it compares to other compact screw drivers. Plenty of power, battery life is great, and I have been using and abusing it 5 days a week for just under a year now. Next addition to my tool bag will be the ps40-2. This is a nice little driver to have around for those areas that are hard to get to this will help you out. I like mine. Just put this in your hand and it feels good. It's a slower speed driver with guts. It is made for driving screws but you can get drill bits for it. They just have to have the hex type base on them. This driver does not have a chuck. It a quick release type connecter so it never slips. The head pivots which can be handy and the trigger is handy as well. The two batterys last quite a long type for how small and lite they are. I really like mine. Great tool when you're "in a tight spot now"! This is one of those tools that at first look you might think you don't really need, but if you do a lot of installation work you'll find this very useful for situations where any normal drill/driver just simply won't fit. I've used it to fasten conduit clamps above heating and air-conditioning ducts, drawer slides inside narrow cabinets, repairing equipment with very tight access to fasteners, and it works fine for normal use as well. I've also used it to quickly install all of the duplex outlets, switches and wall plates when I'm doing finish electrical work. 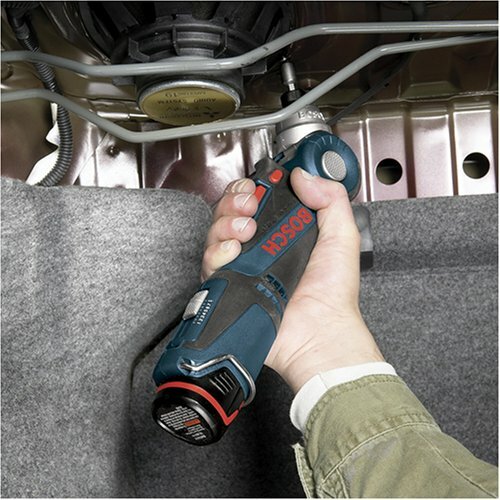 The 10.8 volt version of this tool will also work with the new 12 volt batteries if you happen to have another small format Bosch tool that used them. By the way, I have the newer 12 volt version of this tool. I am a licensed electrician and utilize this screwdriver for almost everything. The batteries last forever and the tool's torque is phenomenal. I used to carry my DeWalt stuff with me for job estimates but now I carry this little tool because of its flexibility, power, and battery reserve. The cheapest place that I have found it is toolup.com. I purchased this a little over a month ago to use at work (A/V installs and mobile electronics). I am very pleased with it. It has more power than I expected, and good battery life. Overall, I'm very pleased with this driver. The feel of the grip and the ergonomics are excellent, as is the pivoting head that gives you the needed flexibility depending on the situation at hand. The caveats (probably kept me from awarding fice stars): 1) As indicated in other reviews, the torque setting doesn't seem to affect the overall torque delivered to the bit as one might expect; 2) there seems to be, under some conditions, a delay between depressing the trigger and the actual rotation of the bit. I'm unsure is this is by design or perhaps operator error, but it's not a primary consideration for me at this point. 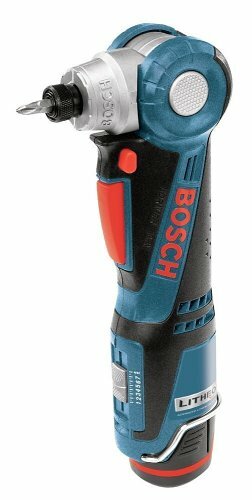 Overall, this is another great Bosch product. The 10.8 volts delivers what you expect. 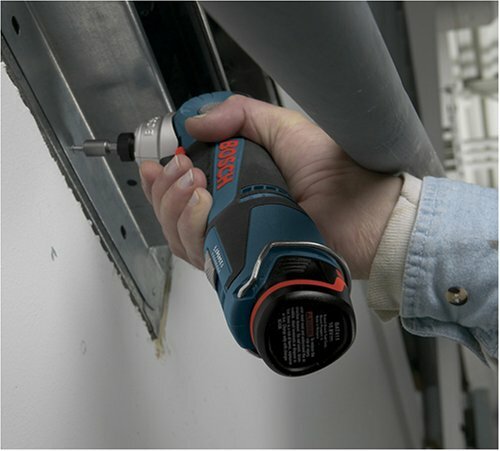 It doesn't in any way substitute for more powerful cordless tools for driving fasterners, but it comes in handy for tight spots and light duty applications, in my opinion.